Eric Sanders (B.S. ‘95, percussion) has served on the faculty of the Atlanta Institute of Music and Media (AIMM) since 2009. A percussion student named Jason Barnes enrolled at the school in 2013, functioning without a right forearm and hand and playing drums with an awkward prosthetic. After dissecting Jason's technique and discovering that the only way that Jason would be able to express himself musically was with use of a myoelectric arm, Eric began researching the subject. Eric's idea was to create a specialized robotic arm for Jason. He first contacted the head of the music technology area at Georg ia Institute of Technology (Georgia Tech), who had developed a marimba-playing robot a few years before. Soon after, a team was assembled and multiple grants from the National Science Fund were secured. Within months, Jason received a new drumming arm and was the featured artist at the Atlanta Science Festival, where he played a duet with Eric, who wrote the composition. Since then, Jason's story has been told by the New York Times, London Times, Atlanta Journal-Constitution, and others. He has also been featured on Fox News, NBC, and The Doctors. Jason will appear as a featured artist at an upcoming technology festival in Russia. Eric Sanders holds a bachelor's degree from Penn State, where he was also awarded a Performer's Certificate. A student of Dan C. Armstrong, he has released two solo percussion CDs on his own label, Flam Five Records, and plans to release two additional CDs in the near future. He is also developing an educational video series that explains many of the concepts, styles, techniques, and theories behind his 50 original compositions for drum set/mallets/auxiliary percussion. He has been teaching, performing, and recording in the Atlanta area since 1996, and has toured throughout the United States and abroad, working with numerous groups and artists performing in numerous styles. 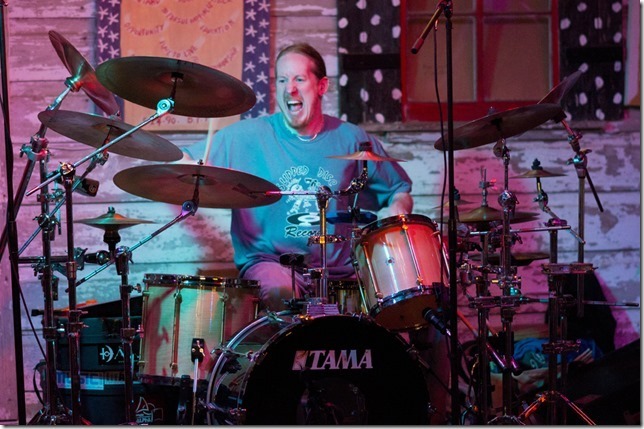 He is the drummer for "The Yeti Trio," a well-respected fusion group which recently celebrated its15th anniversary performing at the Wanee Festival in Florida. In addition, Eric recently started his own business called Crash Course, a corporate program using percussion ensemble as a team-building strategy. Microsoft was his first client. Eric serves as head of the drum department at AIMM. In addition to writing a comprehensive snare drum method book based on rudiments, Eric continues to rewrite the college curriculum and add new classes. He is currently designing a marimba program. Outside of his teaching, Eric maintains a successful private teaching studio, and he presents classical percussion clinics and masterclasses to middle and high school students in the metro Atlanta area.